I mean you can eat 10 hot dogs if you want, just not every day...right? I believe in this saying on all levels that it could possibly be applied to. I have never heard of this expression until entering recovery for an eating disorder, and I realized that it can be used in so much more than just recovery. Let’s begin with recovery first, though. Moderation doesn't mean not having too much of something; it also means not having too little of something either. One huge issue I had when struggling with the darkest of my disorder was this moderation on both sides of the spectrum. I had no idea how to manage things moderately and either reached too extreme of one thing or too extreme of little. I know I am not alone in this either. Being around college students every day, I have realized that I am not the only one who struggles with living a lifestyle in moderation. I have heard so many people say they aren't going to eat a meal because they know they are going to eat more later. One thing's first: how do you know how much you're going to eat at any given point? Yes, you may anticipate eating a little unhealthier or a little more than usual, but you never know if you are going to get full or how much your body will actually want to eat anyway. And this is where we get into the issue of under-eating. So someone will eat under moderation in preparation for either drinking or eating over moderation, and this is not a healthy lifestyle. The first thing we can do is try and listen to our bodies and not let our negative opinions on the way we look influence how we treat our health. So many of us are unhappy with how we look that we allow this to act a certain way. We think we are “too” big and don't eat when we are starving or get ahead of ourselves and drink too much when we are out. Our minds—especially the low self esteem part of them—oftentimes influence our decisions when we really need to start using mindfulness to combat these thoughts. We know deep down that skipping lunch to go out and eat a big dinner isn't healthy, and if we take a step back we will remind ourselves that. Honestly, skipping a meal will only make us overeat even MORE than we probably would have in the first please. If we learn how to eat when we are hungry, eat what we WANT to eat, and stop when we are full, then it will become a habit; we will no longer look to our insecurities of our bodies and the beauty standards around us to influence how we fuel ourselves. I would waste an entire day sleeping (oversleeping) and then purposely not eating until late at night because I told myself I would be drinking too many calories and drunk eating that night, and I couldn't afford food during the day. First of all, going into the night with the mindset of “I'm going to eat and drink too much” sets the tone right there and makes you so much more likely to actually do it. Secondly, if I ate during the day I probably wouldn't have gotten as drunk, wouldn't have been as hungry at night, and wouldn't be as sluggish the entire day if I woke up at a normal hour. Instead of telling ourselves these things, we can instead tell ourselves, “okay let me eat a healthy, filling breakfast, lunch, and dinner when I feel hungry and stop eating when I am not hungry anymore.” If we do this, we will go into the night already satisfied, knowing we ate “healthy” throughout the day, and not be starving to the point of bingeing that night. We can't deprive our bodies of something they need, and we can't over-serve it something that it doesn't need too much of. This also relates to exercise in recovery and when suffering from an eating disorder. There comes a point in a workout where it is no longer useful if you are too tired to be productive. Forcing yourself to workout for two hours straight when there is not enough fuel put in your body to burn, you start burning energy and important muscle. When you don't workout at all, your heart health declines and you don't meet the daily amount of exercise that is said to keep our bodies healthy. We need to instead find the exercise we personally enjoy doing and do the workout for the amount of time that our bodies will feel good from. 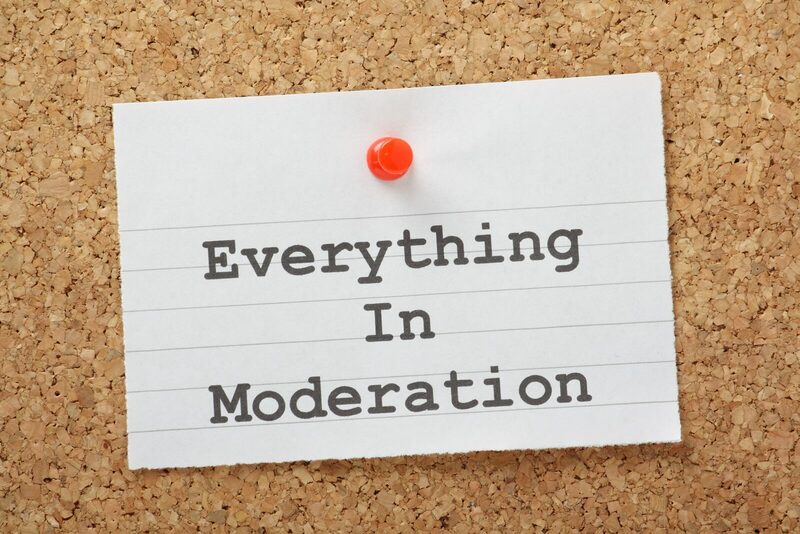 Moderation goes so far beyond just food—it goes for anything in life. Too much of something can take the meaning out of it. When someone tells you they love you everyday, it becomes second nature and has little to no impact on our emotions. When someone never tells you they love you, you start to forget what love feels like. We need to learn how much of something we need for our own particular lives—which takes time—but when we do find it, our lives will feel in balance and so will our happiness.